On one trip to visit the Salsa Man in the Pittsburgh Public Market a few weeks ago, he convinced me to try marinating shrimp in his spicy Ranchero Sauce, made with tomatoes, garlic, onions, and arbol peppers. I thought that sounded like a pretty good idea, but what would I pair the shrimp with? In a large Ziploc baggie, marinate shrimp in Ranchero sauce in the refrigerator for a few hours. Add rice and the next 7 ingredients (through bay leaf); cook 2 minutes. Add broth, water, tomato paste, chopped tomatoes, tomato puree, and Ranchero sauce marinate (but hold off on the shrimp for now); bring to a boil. Cover, reduce heat, and simmer 20 minutes. Add shrimp; cook 5 minutes. Let stand 5 minutes. Discard bay leaf. Stir in parsley. 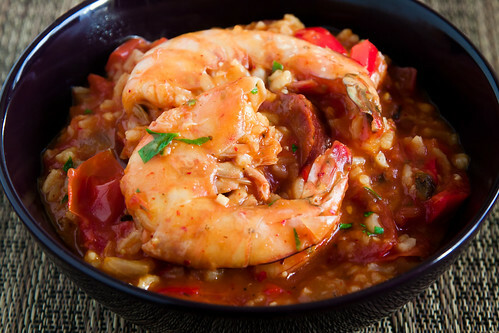 I loved the result, and it added a much spicier kick to the jambalaya than the original recipe. I think Cinco de Mayo's Ranchero Sauce definitely helped to improve an already solid recipe from Cooking Light!